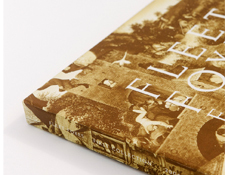 So, for friends who I keep trying to turn on to this "new band" called Fleet Foxes, it was kind of sobering to recognize the time that has passed as I began exploring the 10th Anniversary boxed set celebrating their debut. Now to some of you, a boxed set might seem a bit overkill for a "indie band" like this but I don't think so. Actually, I think its pretty much quite perfect. Here in this set -- called Fleet Foxes First Collection 2006 - 2009 -- you get not only their debut album but also three -- count 'em 3! -- ten-inch 33 1/3-RPM mini LPs comprising their other recordings from this period. Included is their first EP which was apparently produced in super limited quantity, 50 CD-R copies reportedly sold at local gigs; it is that which ultimately got the band signed to the Sub Pop Records label. So now we get to hear those early (and remarkable) recordings on nice vinyl! You also get their debut EP (extended play) release called Sun Giant now pressed on a 10-inch vinyl form (as far as I know it was also originally issued only on CD and later added as a bonus disc in the LP edition of the debut album). And, you get another ten-incher of b-sides and unreleased tracks (cleverly titled B-Sides & Rarities). 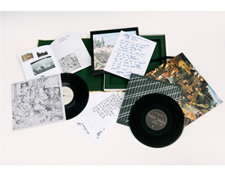 All of these recordings in Fleet Foxes First Collection 2006 - 2009 come to you on standard weight vinyl that is quiet, well centered and nicely pressed. No problems on that front throughout the boxed set. A lot of care went into this package which also includes a booklet containing interesting photos from the period as well as lyrics, flyers and other memorabilia. How is the music you ask? Pretty fantastic actually! The amazing thing you hear while listening to this collection is that the Fleet Foxes sound was born fairly fully formed and ready to go judging by the quality of these early recordings. The debut EP is quite stunning given they were simply an unknown indie band. Its a very impressive debut, put together mostly by Robin Pecknold and produced by Phil Ek (who has worked with some pretty big name bands like The Shins, Modest Mouse, Band of Horses, Built to Spill and Mudhoney). From my vantage point -- as a fan of all things indie, folk and alternative rock and production styles large and small -- this band is totally deserving of this sort of deluxe treatment of their early work. I consider them an important band carrying the torch of voice-centric, lyrically thoughtful, rocking and melodic acoustic-based / electrically driven pop music. Fleet Foxes are sort of like what might happen if a great David Crosby & Graham Nash driven CSN album was produced by Thom Yorke of Radiohead and engineered by Phil Spector circa 1964, with SMiLE-era Brian Wilson assisting. Big praise, but a fair assessment I think. These recordings are lovingly made and might even be demo worthy for some of you out there in audiophile land. Fleet Foxes hit the ground running and were placed on a strong trajectory that continues to this day. Their last album, Crack Up, was one of my favorite releases of 2017 and their show at Berkley's Greek Theater a wondrous highlight concert experience for me last year. I first "discovered" this band just as their second full length album came out, Helplessness Blues. I remember the moment clearly in those pre-Shazam days when I stopped into a coffeehouse in Santa Barbara, California, while driving to LA and this music came on the house sound system. I asked the 40-something woman behind the counter who they were and she informed me with a bit of incredulity that it was Fleet Foxes, surprised I hadn't heard them before. Who knew? 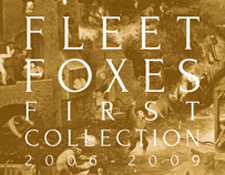 So here we are in the years and this new Fleet Foxes First Collection 2006 - 2009 boxed set is really lovely. Overall everything sounds great. I give a little edge to my original LP pressing of the first album and the Sun Giant EP for its slightly richer sound but its super close. If you are a completist fan -- which you probably are if you are buying something like this -- then you'll want to hold onto your old pressings -- just because -- and still enjoy this new one with its trio of 10-inch mini albums. They are pretty fab! Of the songs on the debut EP, "Anyone Who's Anyone" and "So Long To The Headstrong" jumped out as especially cool tracks with quirky driving rhythms and catchy hooks. "Icicle Tulsa" points to the more ethereal rustic direction the band would pursue when signed to Sub Pop records with close harmonies and interesting finger picked guitar signatures defining the sound. Their early sound was very much in the vein of a rocking indie pop band, reminding me a bit of another Northwestern band I like, The Helio Sequence. I also like the B-sides "White Lace Regretfully" with its spacey 12-string texture and the beautiful lilt of "Isles." The early sketches and demos of later songs like "Ragged Wood" and "He Doesn't Know Why" are fascinating when you realize that songwriter and lead singer Robin Pecknold is doing all those harmonies overdubbed himself. Talk about having a clear vision on the sound you want! "Silver Dagger" is a lovely traditional folk standard, further cementing my belief in Fleet Foxes as part of the modern pop-folk music continuum. Of course, since I somehow didn't consider that Fleet Foxes might have issued "singles" in the past, I now have to track down the original singles for my collection! Ah, the rigors of being a completist fan! 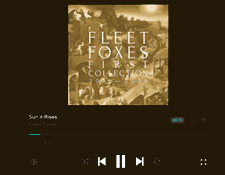 For those of you who like to stream music on Tidal you'll be happy to know that Fleet Foxes First Collection 2006 - 2009 is up there in 16-bit, 44.1 kHz fidelity. It generally sounds real nice as CD-quality streams go. You can jump to the set there by clicking here. Of course, if you want a more high fidelity treat please click on the Fleet Foxes titles that follow which are all available in MQA format streaming at 96 kHz or 88.2 kHz and 24-bits : Crack Up (2017), Helplessness Blues (2011) and Fleet Foxes (2008). For those who want a better sound on this box set however, you might want to spring for the physical media as you also get a download with two options: 320 kbps MP3 and 44.1 kHz, 24-bit FLAC (actually, my VLC player shows it at 32-bits but I'm not sure if that is accurate; however, I suspect its at least 24-bit as it sounds very rich). Of the two, the FLAC is preferred but the MP3s will probably work fine for mobile devices (you can download both formats, as I did). The bottom line is you do get the music from Fleet Foxes First Collection 2006 - 2009 in a variety of good sounding high fidelity digital formats and that is a nice thing because not all boxed sets give you that option these days. Anyhow, the alternative new folk rock circle game continues with these fine Fleet Foxes, winding us musically deeper and wider across sunny vistas and into dark corners. As Joni Mitchell sang so long ago "We can't return we can only look behind from where we came." The Fleet Foxes future sounds brightly promising.